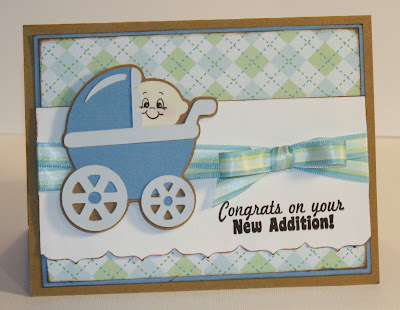 Just a quick project I made with our new Simple Sentiments stamp set. I found these golden dollar chocolate coins and thought of this stamp right away! You can't tell but I used a Wobbles on the money bag - they are sooo stinkin' cute! I tried to film a video for you but I have an old camera and the video won't load. I think it's the wrong type and I'm too tired to research how to change it. LOL If you haven't checked out Wobbles yet I highly recommend that take a look at their facebook - they have links to other projects. You'll love them!! 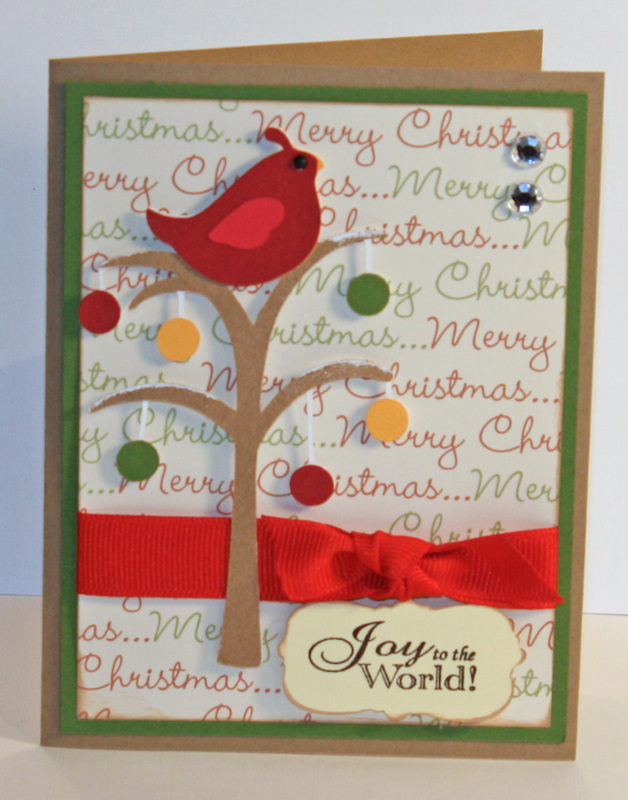 The money bag is cut at 2.5" from Smiley Cards - my 1st cut from this digital cart - Yay! 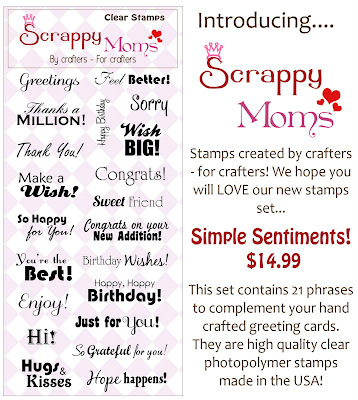 Oh, and a big THANK YOU to all that joined us for our Scrappy Moms Stamps Thankgiving special! This week the Scrappy Moms Stamps Design Teams is introducing our newest set - Simple Sentiments. This set is designed to be a companion to our Everyday Greeting set - more versatile saying for your greeting cards. This set will be available for purchase starting tomorrow! 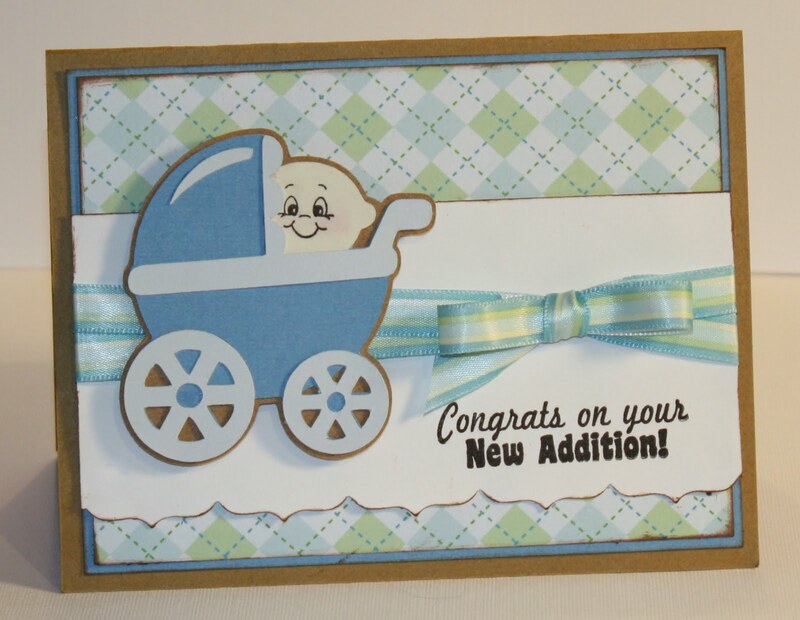 I hope you liked my easy card - be sure visit the other Design Team Members for more Simple Sentiment sneak peeks! They are listed on my right side bar. 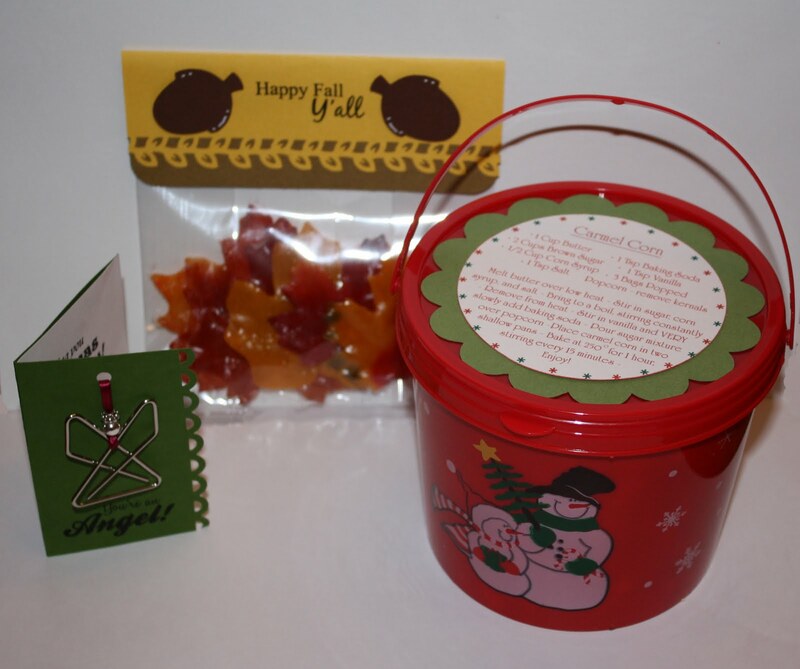 The Gift Giving Season Has Started! :) ** Info Update! We had the last meeting for the year at my MOMS group so I made little gifts for all the ladies at my table. I started off making a cute little fall-themed project I saw on Greenbean's Crafterole (if you haven't visited her before take a few minutes for look around - she's awesome!! ) - soap leaves! Then I made some homemade caramel corn (Yum!) and put it in these cute little holiday buckets with the recipe on top. 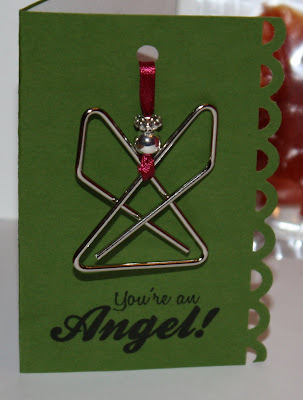 Last, but not least, I made little angel Christmas tree ornaments from butterfly paperclips. YES, PAPERCLIPS! I saw this idea on line while looking for a craft project for my Brownie Girl Scout to do with her troop at their Christmas party. So I was browsing the stamping section and this caught my eye. I like my stamped images to be really dark black and most of the other ink pads I own come out just slightly (or in some cases, more than slightly) grey. So I used a coupon and hoped for the best. 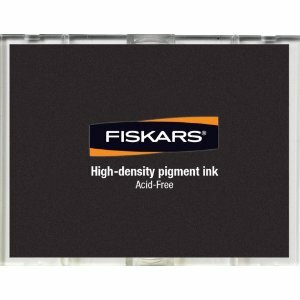 Sure it takes an extra step but I LOVE that the stamps are so dark and clean - it's totally worth the extra few seconds. So now that I have enabled a few of you, do you have any products that you LOVE? I'm always looking for a new favorite item to add to my list, so I'd love to hear from you if you do. I put a little white embossing powder on the tops of the branches to look like snow and added a little bling with the crystal gems. Hope you enjoyed my little card. Have a WONDERFL day!